I wanted to revisit the topic of batch processing techniques, because I talked about some of my findings in 2014, and also made reference to batching in a recent podcast episode. Just so you know, I am writing this post on January 9. You will see why that’s relevant in a moment. 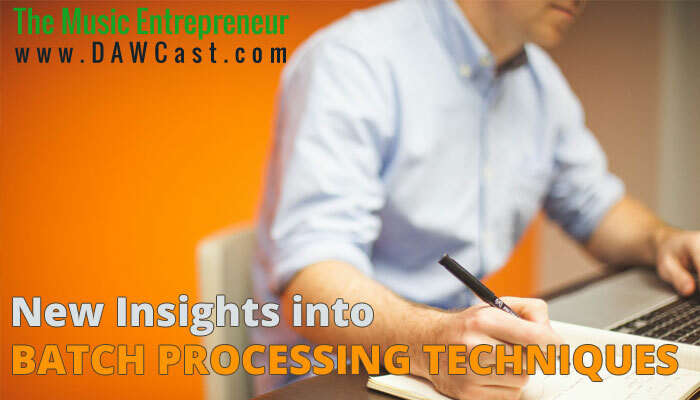 Batch processing is a time management technique. It involves grouping tasks together in your routine in order to reduce the time and energy costs associated with jumping from one activity to another. Task switching can be a major killer of willpower, but sometimes we do it anyway for the sake of getting more checkmarks on our to-do lists. It serves to reason that if you can keep your focus for longer on a single task, you will have to switch less and get more done. I wanted to touch on this subject again, because what I have been able to accomplish so far in 2015 (again, it’s January 9 as I write this) has blown my mind. Get ahead of my content schedule here at The Music Entrepreneur. As you may know, I publish weekly podcast episodes on Mondays and blog posts on Thursdays. As of this writing, I am roughly a full month ahead, with podcast episodes and blog posts scheduled out to February 2. Create and schedule new content for my AS Movies & Games site, all the way out to January 23 (essentially five posts per week). I don’t necessarily have plans to sustain that kind of ethic with that site, but the outsourcing and marketing experiment is still in progress, so I’m pushing hard until that’s done. Create and schedule new content for Outsource Blog Content. I publish weekly posts over there, so I am covered up to January 23 as of this writing. Write a full month worth of posts for two of my ghost writing clients. This means that I don’t even have to think about them until February! Upload eight new videos to a couple of my YouTube channels. Of course, I could just say that batch processing is the answer, but then I wouldn’t be giving you a whole lot of value, would I? One of the amazing things that has happened here in the New Year is that I have had a strong determination to bolt it out of the gate. There are certain things I can’t stand to not see happen here in 2015, so I guess you could say that I have a set of non-negotiables; things that have to happen. You’ve heard it before, but it’s worth repeating; without a strong why, you won’t make the sacrifices you need to make in order to reach your goals. I am motivated to get out of financial complications, release new products by specific deadlines, and in general do more than I did the year before, especially with this website. The rest of it was mostly a willingness to go through the pain of doing something now so that I could be freer later. Obviously, the sooner I complete the tasks on my plate for this month, the sooner I can get to next month’s duties or extracurricular activity, whether that’s outreach, marketing, guest blogging or additional freelance work. Now that I am ahead of schedule with most things, the idea is to get ahead and stay ahead. For example, knowing that I am about a month ahead with blog posts for this site, all I have to do now is write one more post each week to stay on top of the content schedule. Batch processing isn’t always easy, as reflected by my earlier reflections on it. What it comes down to is that you need a strong enough motivation to do it, because believe me it isn’t always fun to sit at your desk and just plow through the work until it’s done. Again, you also have to be aware of your deadlines and completion dates. You shouldn’t let them dictate to you what needs to happen in your routine, but you do need to plan your schedule accordingly so that you can get on the ball and stay on top of it. Have you tried batching your tasks together before? Did you discover anything interesting? Are you now motivated to try it for yourself?